Eurozone finance ministers say they expect to hear new proposals from Greece after the country voted to reject the terms of an international bailout. Jeroen Dijsselbloem, head of the Eurogroup of finance ministers, said "difficult measures and reforms are inevitable" for Greece to recover. The finance ministers are to hold emergency talks on Tuesday. Earlier, Greece's outspoken Finance Minister, Yanis Varoufakis, resigned. He said that eurozone finance ministers, with whom he had repeatedly clashed, had wanted him removed. Meanwhile, the European Central Bank (ECB) is to discuss whether to raise its emergency cash support for Greek banks, which are running out of funds and on the verge of collapse. Global financial markets have fallen over fears that Greece is heading for an exit from the euro. In his statement, Mr Dijsselbloem said the result of the referendum was "very regrettable for the future of Greece". 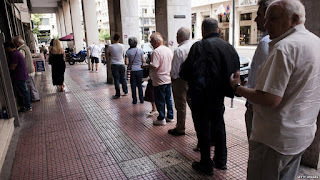 "For recovery of the Greek economy, difficult measures and reforms are inevitable. We will now wait for the initiatives of the Greek authorities," he said. German Chancellor Angela Merkel's spokesman Steffen Seibert said there was currently "no basis" for talks on a new bailout package and the ball was in Greece's court. "It is up to Greece to make something of this. We are waiting to see which proposals the Greek government makes to its European partners," he said. Mrs Merkel is to meet French President Francois Hollande in Paris on Monday. At a news conference in Brussels, the European Commission vice-president for the euro, Valdis Dombrovskis, said the Greek government needed to be "responsible and honest" with its people about the potential consequences of the decisions it was facing. "The 'no' result, unfortunately, widens the gap between Greece and other eurozone countries," he said. "There is no easy way out of this crisis. Too much time and too many opportunities have been lost." But he said the stability of the eurozone was not in question, adding: "We have everything we need to manage the situation." Among the German tourists taking photographs outside the Reichstag in Berlin I met Peter. The Greeks, he told me, "aren't willing to pay back their debts and I'm not very happy about it. I want Greece to think of the whole of Europe and not just themselves". It's a commonly held view here. Greece may push for a debt cut or restructuring - especially after the IMF said that is exactly what the country needs - but it simply won't wash in Berlin. Greece must successfully institute reform first, said the German vice-chancellor today. To offer debt relief now, said Sigmar Gabriel, would destroy the eurozone. Greece's Economy Minister, Georgios Stathakis, told the BBC the ECB had to keep Greek banks alive for seven to 10 days so that negotiations could take place. But even if the ECB continued to freeze the Emergency Liquidity Assistance (ELA) at €89bn (£63bn; $98bn), the current cash withdrawal and transfer restrictions on banks of €60 per day could stay in place until Friday without any of them collapsing, he said. Greek Prime Minister Alexis Tsipras said he was willing to go back to the negotiating table on Monday, noting that an International Monetary Fund (IMF) assessment published this week confirmed that restructuring Greece's debt of more than €300bn was necessary. However, German Vice Chancellor Sigmar Gabriel warned that any unconditional debt write-off or "haircut" would destroy the single currency. "I really hope that the Greek government - if it wants to enter negotiations again - will accept that the other 18 member states of the euro can't just go along with an unconditional haircut," said Mr Gabriel, who is also Germany's economy minister. "How could we then refuse it to other member states? And what would it mean for the eurozone if we'd do it? It would blow the eurozone apart, for sure." Mr Varoufakis said it was felt his departure would be helpful in finding a solution to the country's debt crisis. He said he had been "made aware of a certain preference by some eurogroup participants, and assorted 'partners', for my... 'absence' from its meetings". 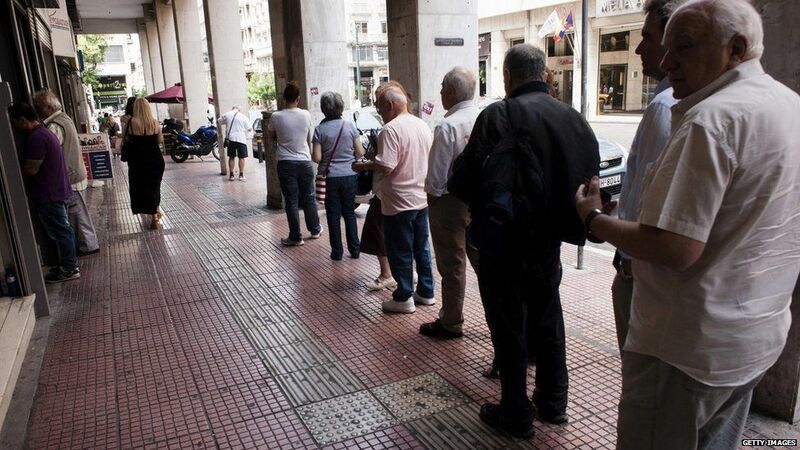 Greece's last bailout expired on Tuesday and Greece missed a €1.6bn payment to the IMF. The European Commission - one of the "troika" of creditors along with the IMF and the ECB - wanted Athens to raise taxes and slash welfare spending to meet its debt obligations. Greece's Syriza-led government, which was elected in January on an anti-austerity platform, said creditors had tried to use fear to put pressure on Greeks.